So, exactly WHAT does someone who works for the National Health Service in Britain, know about the United States Department of Health and Human Services (HHS), Food and Drug Administration (FDA), National Cancer Institute (NCI) at the National Institutes of Health (NIH), and the U.S. Federal system? Let’s find out, shall we ? Which “conspiracy theory” would you like to address? FW, what year did Burzynski start clinical trials? FW, speaking of “[[no]] credible evidence,” where is the American Cancer Society’s antineoplaston clinical study? 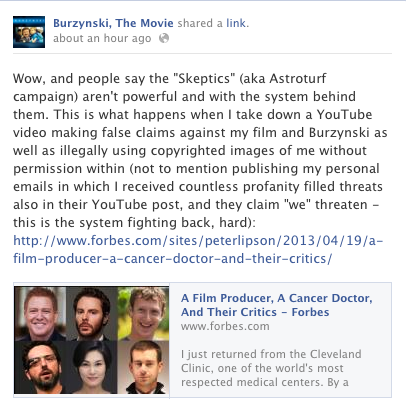 FW, have you won a Nobel Prize, and why should anyone care what your biased opinion of Dr. Burzynski is? FW, have you read these? FW, why was the FDA requiring “radiation” in the phase 3 clinical trial? Do you know how utterly, completely, fruit looping bonkers that is? FW, being from the United Kingdom, are you even knowledgeable about the FDA warning letter process? FW, what do you call THIS? FW, as I said earlier, did you pay attention to this? why was the FDA requiring “radiation ” in the phase 3 clinical trial? FW, isn’t EVERY drug in the clinical trial process “unproven therapy,” until such time as the FDA approves it? Are you saying that because EVERY drug in the clinical trial process is “unproven therapy,” there should be NO clinical trials AT ALL? FW, what information do you have from the FDA that supports your comments? FW, where are your reliable independent sources (citation(s), reference(s), and / or link(s)? FW, so, unfortunately, even though your family “got the best care available,” they still passed? FW, which are YOU ? Boris Ogon, Boris Ohhh … Gone, where art Thou? We miss You!